The majority of businesses today are global, yet markets are local. In order to be one of the 37% who do succeed, you need to fully understand and know how to take action to successfully confront and overcome new levels of chaos and uncertainty in your global business environment! Together with my world-class Leadership Coaches located around the globe, we ensure you are prepared to accelerate and motivated to tackle the opportunities and challenges inherent in today’s global business environment. In order for you to expedite development and achieve ultimate success, there is no better way to acquire the skills necessary to contribute in progressively meaningful ways than to have a Trusted Advisor with relevant knowledge and experience that can discuss and debate strategic options, someone who will enhance your strengths and develop you into the world-class leader you were meant to be. A Partner, both strategic and tactical, that understands how to help you with your global challenges and maximize your opportunities is absolutely essential to your success. 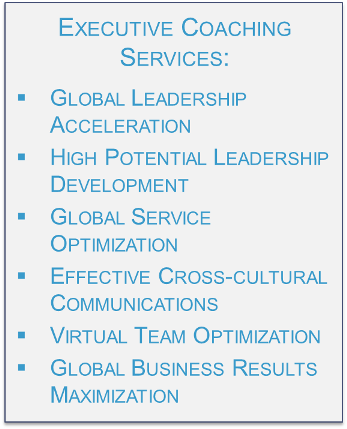 Whether you need help with global leadership acceleration, service operation efficiencies, cross-cultural communications or virtual team development, I am the expert to help you maximize your global business results! This page provides an overview and information that I hope will be of value to you in selecting the right coach. Click on the links below to take you directly to the relevant sections. If you want to check my availability, or if you have some questions before proceeding further, please email me at sheri@sherimackey.com.